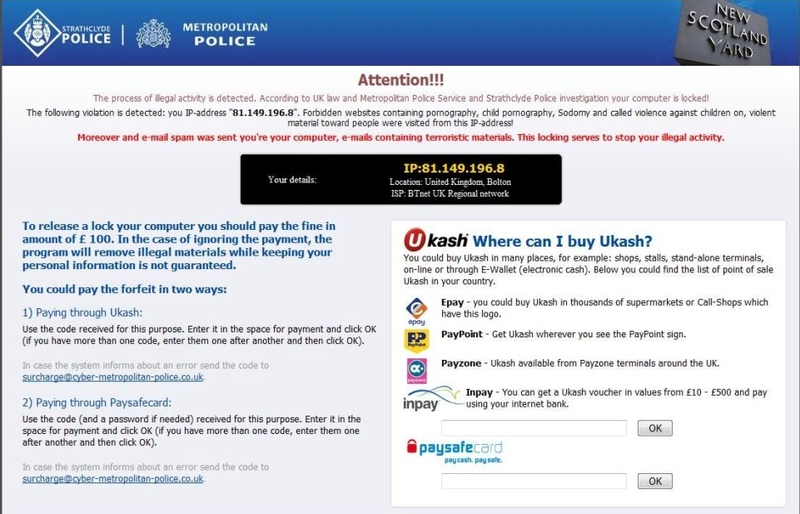 The Metropolitan Police have issued an urgent warning about a new ransom malware that is in circulation. Ransomware (also referred to in some cases as cryptoviruses, cryptotrojans or cryptoworms) comprises a class of malware which restricts access to the computer system that it infects, and demands a ransom paid to the creator of the malware in order for the restriction to be removed. "The "malware" infects personal computers after users have accessed certain websites. *(It should be noted that there are several similar designs currently in circulation)"
Ransomware typically propagates like a typical computer worm, entering a system through, for example, a downloaded file or a vulnerability in a network service. The program will then run a payload which will begin to encrypt personal files on the hard drive. More sophisticated ransomware may hybrid-encrypt the victim's plaintext with a random symmetric key and a fixed public key. The malware author is the only party that knows the needed private decryption key. Some ransomware payloads do not use encryption. In these cases, the payload is simply an application designed to effectively restrict interaction with the system, typically by overriding explorer.exe in the Windows registry as the default shell, or even modify the master boot record, not allowing the operating system to start at all until it is repaired. We request readers to share this article with your friends on all social networks to alert them that this is a fraud and users are advised not to pay out any monies or hand out any bank details. Police advice - "We would advise anyone who has been deceived by such a message and parted with any money to report the offence to their local police by dialling "101" or your local police. Virus/Malware infections where no money has been lost can be logged at www.actionfraud.org.uk/report_fraud." Modern ransomware attacks were initially popular within Russia, but in recent years there have been an increasing number of ransomware attacks targeted towards other countries, such as Australia, Germany, and the United States among others.